The clock is about to strike midnight and the official implementation date of ICD-10 will soon be here. This long-anticipated date, dreaded by some, is now upon us and most people in the industry seem to be ready to move forward to see what the real impact of ICD-10 will be. 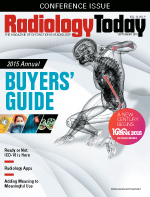 Compared with most other specialties, radiology is in a unique position in that the radiologists themselves do not really participate in the coding process except as it relates to their documentation. Radiologists predominantly have employed staff or a contracted billing company perform this function for them. While that relieves some stresses, it reveals other issues that impact coding that may or may not be beyond the control of the radiologist. This article will highlight the key items that each radiology organization should evaluate as a final review for coding and documentation practices to ensure as smooth an ICD-10 implementation as possible. In July, the Centers for Medicare & Medicaid Services (CMS) issued a joint announcement with the American Medical Association to address the concerns of physicians regarding the implementation of ICD-10-CM. However, this announcement generated more questions than answers, so CMS issued a clarification later in the month to address specific areas of concern. The policies apply to physician and practitioner claims billed under the Part B Physician Fee Schedule, and to reviews performed by Medicare administrative contractors (MACs), recovery audit contractors, zone program integrity contractors, and the supplemental medical review contractor. There are several issues addressed in these announcements, most notably code specificity. CMS announced that during the first 12 months following ICD-10 implementation, its review contractors will not deny claims "based solely on the specificity of the ICD-10 diagnosis code as long as the physician/practitioner used a valid code from the right family." A "family of codes" refers to an ICD-10-CM three-character category. For example, a provider would not be penalized on postpayment review for submitting code J32.9 (Chronic sinusitis, unspecified) even though the record indicates the patient had chronic maxillary sinusitis (J32.0). The ICD-10 flexibility policy applies only to postpayment reviews, not to prepayment reviews, prior authorization, or initial claims adjudication. Claims will not be processed unless they include valid ICD-10-CM codes. In the example above, the claim would be rejected if the provider submitted it with code J32, since this code is further subdivided into four-character codes. From a radiology perspective, perhaps the most important area of concern is the new change that if a national coverage determination (NCD) or local coverage determination (LCD) limits coverage to specific diagnosis codes, the claim must include one of those codes, or it will not be paid. For example, one contractor's LCD for myocardial perfusion studies includes several codes from ICD-10-CM category I51 (Complications and ill-defined descriptions of heart disease). However, it does not include code I51.9 (Heart disease, unspecified). If a provider submits code I51.9 for a myocardial perfusion scan, the claim will not be paid even though this code is in the same three-character category as the covered codes. Also, CMS points out in the frequently asked questions that LCDs and NCDs that contain codes for right side, left side, or bilateral do not allow the provider to report the code for unspecified side. Finally, it is imperative to remember that ICD-10 flexibility is a Medicare policy and does not apply to Medicaid plans or nongovernmental payers unless they choose to adopt it. All radiology services require a valid order from the patient's treating physician. All orders must be patient-specific, encounter-specific, clearly indicate the exam requested by the treating physician, and include the reason for the study. The implementation of ICD-10 does not require a change in how providers practice medicine or treat patients, but rather it demands more accurate documentation and gives providers more diagnostic choices to capture new data to ensure they are paid for the complex work they perform. Obtaining complete and accurate orders has been an ongoing challenge for radiology practices and this concern will be amplified in ICD-10. The additional details required to assign complete and accurate ICD-10 codes translate into additional details required on the referring physician order. Specifically, the referring physicians must provide more precise documentation (eg, laterality, specificity, anatomic sites) than they historically have done. Proper documentation can be facilitated through the effective use of EMR templates and prompts, and the data repurposed throughout the EMR to support the "collect once, use many times" concept, but this must be done with thoughtful purpose and care. How referring providers utilize their EMR will have a major impact on the detail and quality of the clinical information provided on radiological orders. To facilitate obtaining complete data, it is important to review all potential intake methods. If paper forms are used, does the space limit the data that the physician is able to provide on the order? If electronic order entry is used, are all the options easily available during the selection process? Sometimes simple changes can be implemented to make a significant impact in the data quality and process flow. There are specific conditions that require additional details to ensure accurate and specific coding in ICD-10-CM. For radiology services, the biggest changes are for fractures and other injuries, stroke, and neoplasms. 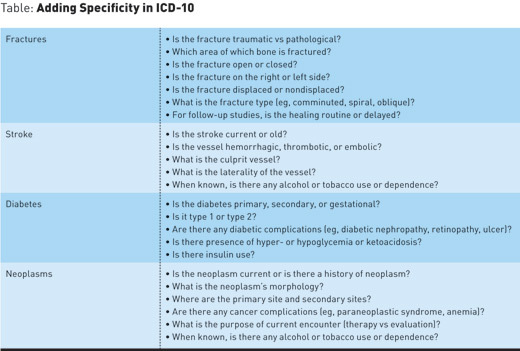 There are many more clinical conditions that have great specificity in ICD-10-CM, but these three arguably have the biggest impact for radiology practices. For example, the ICD-10-CM code for an ulnar fracture could be as specific as "S52.245D—Nondisplaced spiral fracture of shaft of ulna, left arm, subsequent encounter for closed fracture with routine healing." The general process for coding a diagnostic radiology report is the same with ICD-10-CM as it was with ICD-9-CM. The challenge is what to do when there is not sufficient information in the radiology report to assign an accurate diagnosis code. While the problem sometimes does lie with the radiologist(s), many times it is a process issue that allowed insufficient, inaccurate, or missing clinical information to exist on the patient's order for services. The radiologist cannot dictate what he or she does not have access to, so it is imperative that all processes that impact the flow of clinical information be thoroughly reviewed to identify opportunities for improvement as ICD-10 is implemented. When assigning diagnosis codes, the first thing to review is the indications for the exam. Every report should begin by offering information that answers the question, "Why did the treating physician order this exam?" If that information is not present then this creates myriad potential problems. For scheduled outpatient services, there is a breakdown in the process if a patient has received a radiological exam and no one has accurately captured this key clinical information. The problems that exist in an ICD-9 environment will only be amplified in an ICD-10 environment. Next, the radiologist's findings are reviewed. In most reports, this will be well documented in the impression. If the radiologist documented a confirmed diagnosis, this diagnosis should be compared with the reason for the exam to see whether the two are related. If the radiologist documented a confirmed diagnosis that explains the patient's symptoms, this will be assigned as the primary diagnosis. Otherwise, the code(s) for the presenting signs and/or symptoms will be assigned. Additional codes should be assigned according to the ICD Coding Guidelines. Individual payer policies should be reviewed to ensure compliance with the new ICD-10-CM codes and coverage guidelines. For CMS, a list of LCDs converted to ICD-10 is available on the LCDs by Contractor Index, available at www.cms.gov/medicare-coverage-database/indexes/lcd-contractor-index.aspx. To view the information, use the scroll box on the index to select your MAC and select the "Submit" button to view a list of states that the specified MAC services. You can then select your MAC name from the table to view the future translated LCDs. From a coding perspective, one particular area of concern for radiology organizations is determining whether an encounter is initial or subsequent. This information is reflected in many of the injury codes and is designed to provide information as to the stage of the patient's treatment for a particular condition. For certain conditions, providers must report whether the encounter represents the patient's initial encounter for that condition, a subsequent encounter, or a sequela (late effect) of the condition. There is no code for "unspecified encounter," so the coder must choose initial, subsequent, or sequela when assigning the diagnosis code. Examples of conditions that require encounter extensions include most injuries, adverse effects of medications, postoperative complications, and pathological fractures. The term "initial encounter" is not as straightforward as it sounds. It would appear that this term would only apply to the patient's first encounter for the condition, but that is not the case. Instead, an encounter is coded as "initial" as long as the patient is receiving active treatment for the condition. The 2016 ICD-10-CM guidelines (effective October 1, 2016) state that active treatment includes "surgical treatment, emergency department (ED) encounter, and evaluation and continuing treatment by the same or a different physician." As an example, consider a patient who is seen in the ED following an accident and found to have a fractured arm. The arm is immobilized and the patient is referred to an orthopedist. The orthopedist subsequently performs open reduction and internal fixation (ORIF) of the fracture in the hospital's ambulatory surgery unit. In this example, all three of the encounters (the ED visit, the initial office visit with the orthopedist, and the ambulatory surgery) are reported using the seventh character for initial encounter, because the fracture is being actively treated. A "subsequent encounter" is one that occurs "after the patient has received active treatment of the condition and is receiving routine care for the condition during the healing or recovery phase." The ICD-10-CM guidelines give the following examples of subsequent encounter: cast change or removal, an X-ray to check the healing status of a fracture, removal of an external or internal fixation device, medication adjustment, and other aftercare and follow-up visits following treatment. For example, an orthopedist refers a patient to the hospital radiology department for follow-up X-rays one month after ORIF of a fractured humerus. In this situation, a seventh character for subsequent encounter should be applied to the fracture code. There are many details that go into ensuring that the correct encounter type is selected during the coding process. It is important to look at the process objectively and pinpoint where the real problems are in the process. For example, there may not be many concerns related to ED patients since the guidelines allow us to infer that this is an "initial encounter," but certainly locations that see outpatients may have both initial and subsequent encounter visits, so additional information must be gathered during the intake process to accurately identify these patients. Staff involved in assignment of ICD-10-CM diagnosis codes should carefully review both the 2016 ICD-10-CM guidelines and the First Quarter 2015 issue of Coding Clinic for ICD-10-CM and ICD-10-PCS, which contains helpful information and examples for seventh character use. • Claims must contain a valid ICD-10-CM code. • Centers for Medicare & Medicaid Services (CMS) national coverage determinations/local coverage determinations may contain codes for left, right, or bilateral conditions and, if so, codes for unspecified locations will not be paid. • The CMS flexibility policy only relates to Medicare services and not to all payers. • Orders must contain more details to ensure accurate assignment of ICD-10-CM codes. • Changes to intake methods may be required to facilitate receiving detailed information. • Radiologists must dictate additional details for many clinical conditions in ICD-10-CM. • Biggest impact areas are fractures (and other injuries) and diagnoses related to vessels. • All reports must contain the reason for the exam. • Proper diagnosis coding should take the impression, reason for exam, and coverage requirements into account. • Payer policies should be reviewed to ensure compliance. • Ensuring correct code assignment for initial vs subsequent encounters may require additional review and changes to the intake process or other information gathering.